Students will be able to use the root words TELE and SIGN to understand unfamiliar words. Explain that today your students will be learning about two root words, TeleAnd Sign. Define a Root wordAs a linguistic unit, which is the simplest form of a word. Tell your class that root words aren't always words by themselves, but we can add prefixes, suffixes, or even other roots to make words. Remind your students that many of the root words we see in the English language come from other languages, primarily Greek and Latin. Display two pieces of chart paper and write TELE at the top of one and SIGN at the top of the other. Tell your students that TELE is derived from Greek, while SIGN is from Latin. Define TELEAs far or far off, and define SIGNAs mark or seal. Write the meaning of each root on the corresponding chart paper. Tell your students that as a class, they'll be coming up with a list of some words that use these two roots. Write TelephoneOn the chart paper labeled TELE. Explain that the root PhonMeans sound, so a telephone is something that lets you hear sound from afar. Write the meaning of telephone next to the word. Repeat with the words Telescope(something that helps you see at a distance) and Teleport(carried far off). Write ConsignOn the chart paper labeled SIGN. Explain that the prefix Con-Means With or together, so to consign something means to sign something over to another person. Write the meaning of consign next to the word. Repeat with the words Signature(your name written or marked in your own handwriting) and Signal(to communicate silently with signs). Ask your students to think about words that contain the roots TeleAnd Sign. Give your students a few minutes to talk with a partner or small group before sharing with the class. Challenge each pair or group to come up with at least three examples. 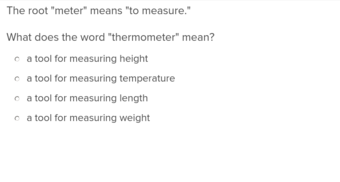 Add student-generated words to the list, without their definitions. Some examples include: Television, Assignment, etc. Display the charts through the remainder of the lesson and add to them as desired. 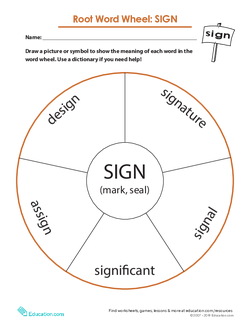 Hand out copies of the Root Word Ladder: TELE worksheetAnd the Root Word Wheel: SIGN worksheetTo each student. Remind students to use the class-generated lists or a dictionary as a tool to complete each worksheet, if needed. Circulate the room as students work and offer support as needed. Review the worksheets when students are finished. For students who need more scaffolding, allow them to use a dictionary or computer to complete their independent work. For an extra challenge, have students create their own made up words by combining the roots TeleAnd SignWith other roots, prefixes, and suffixes they know. Encourage them to get creative and remind them to come up with definitions for their made-up words based on the meanings of the word parts. Form pairs or small groups of students and assign half of the groups the root TELE and the other groups the root SIGN. Instruct students to create a still or moving tableau that shows what the roots mean. Give students about 3 minutes to work with their group. Invite groups to share their tableaus (e.g. a group acting out the meaning of the word TeleMight mime a football being thrown far across the room). This may be challenging for students to create (and their tableaus will vary) but it will provide an opportunity to assess their understanding of the concept and will also serve as a visual teaching tool for the other students who are watching. See the resources for additional information about using tableau as assessment. Use observations from guided and independent practise to identify students who will need additional support. Collect and check finished worksheets to check for understanding. 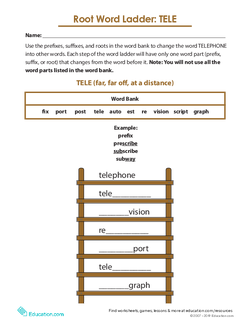 For additional optional practise with root words, use the worksheet Prefixes, Suffixes and Roots Word Ladder. Play root word charades! Choose a few volunteers and assign them words to act out silently. Allow the class to guess what word they're acting out (e.g. signal, signature, teleport, telescope). Practise the root word TELE with this word play worksheet, perfect for strengthening vocabulary skills. Use this resource to study the root word SIGN. Students will understand just where their vocabulary words come from with this root words exercise. Challenge your grammar sleuth to find all the root words hidden in this word search. Understanding root words is crucial for learning the meaning of unfamiliar words and building vocabulary. Use this resource to study the root word RUPT. This worksheet encourages students to work together to think of as many examples of common root words as they can. Use this resource to study the root word SPECT. Students will work both independently and in pairs as they work on a bunch of fun worksheets. Use this resource to practise identifying words with suffixes and determining the meaning of the word. Understanding prefixes is crucial for learning the meaning of unfamiliar words and building vocabulary. Use this resource to study the prefix ex-. Understanding prefixes is crucial for learning the meaning of unfamiliar words and building vocabulary. 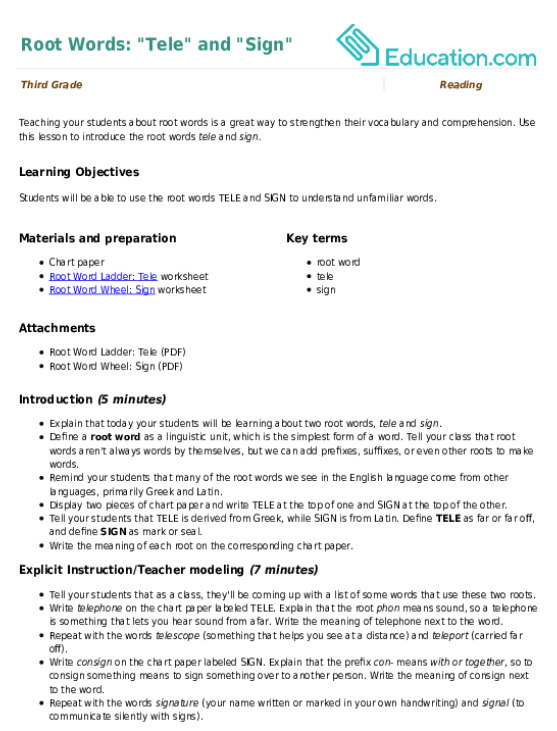 Use this resource to study the prefix pre-.